We've got a love-in going on over at Copenhagen Cycle Chic this week. It's La Semaine du Vélib' over there, wherein we celebrate the birth of bike culture in Paris since the introduction of the Vélib' bike share programme last year. 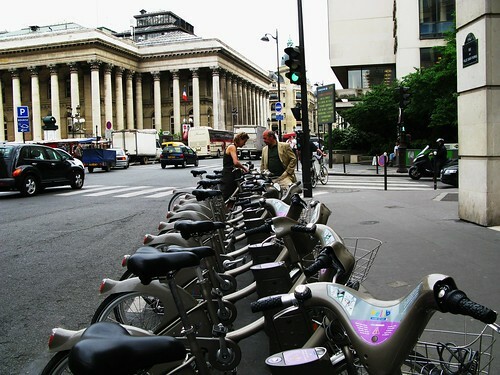 I just spent three days in Paris with Wifealiciousness and two of them were on Vélib' bikes. It was an astounding experience, even after hearing so many good things about it from afar. I've lived in Paris and have been a regular visitor for years so I was not a little amazed to see the drastic change in the urban landscape. The Copenhagenization of the French capital has not just begun, it has developed in leaps and bounds. There are 20,000 Vélib bikes at about 1500 racks around the city. Add to this thousands of normal bikes that have crawled out of the woodwork and rolled out of the bike shops. I've driven in most American states and Canadian provinces, every Australian city and 20 odd countries around Europe. And I've driven in Paris many a time. This witches cauldron of automotive hell is second only to Roma on the stress and chaos level, in my experience. The life-size bumper car ride that is Paris makes New York look like a parking lot. How on earth would such a chaotic city deal with this sudden and drastic change? Amazingly... with ease. 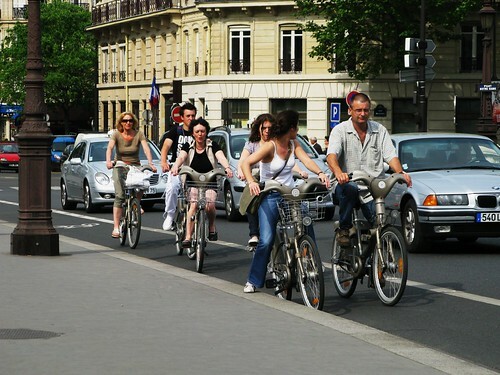 The cyclists of Paris are everywhere, on every street and at all hours, and yet the cars and trucks have adapted to them. In the space of 10 short months. The first thing we noticed was that everyone rides. Men and women, young and old. And the fact that so many women ride - easily 50% - is a telltale sign that there is a karmic co-existence in play. We spent the first day doing things we usually do in Paris, all the while watching the cyclists. Dapper old chaps, chic jeunes femmes, kids and parents - they all moved effortlessly through the traffic. There was no fear to be seen and that fact was what helped Wifealiciousness hop on a Vélib on the second day. 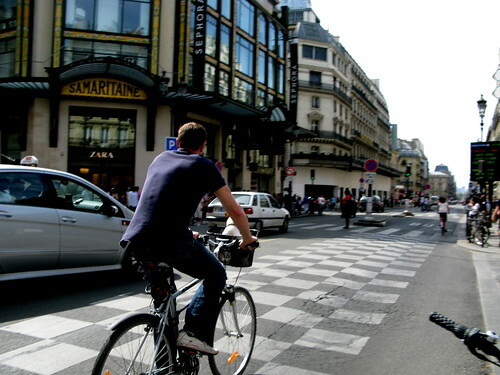 The greatest hurdle to implementing bike culture on a city without it is this co-existence between cars and cyclists. Paris sussed it out in no time. Turning cars stop for bikes continuing straight on. The cyclists are watchful and attentive. And this is PARIS! It's the greatest hurdle because you can't expect it to happen. You can't force it upon people. But Parisians have accepted it without question. The City of Paris has done their homework, too. If you want bike culture, you need segregated bike infrastructure for the bikes. By and large, the bikes follow the existing bus lanes. Busses in Paris stop frequently so you can usually stay ahead of them, but when they overtake cyclists they do so cautiously and slowly. Taxis are also allowed to use the lanes but they, too, excercise caution. I asked Wifealiciousness if she, at any point, felt scared after two days [and one late night] on the streets. Not at all. Apart from the bus lanes - now bus/bike lanes - there are many places that have segregated and dedicated bike lanes. This is, of course, the key to developing bike culture. If there was a book called Bike Culture for Dummies, this would be on the first page. We rode along the Seine late Saturday night on dedicated bike lanes, all the way from Pont Neuf to the Eiffel Tower. What a glorious ride. On Sundays, that great European Sunday pasttime - the promenade - is a treat in Paris. 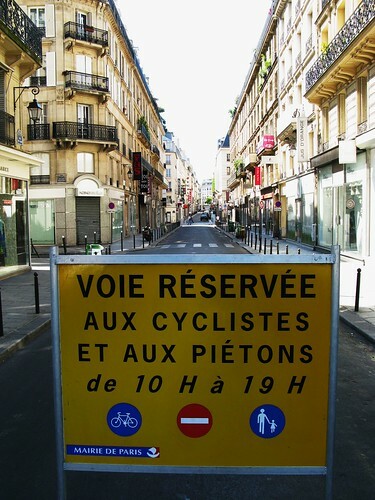 The road along the Seine is closed to cars from 9-17 and many streets throughout the city are closed, like in the photo above. Give the citizens a day of total freedom and they'll feel even more free on the other six days on the bike lanes. There are so many excuses as to why implementing bike culture is so difficut in cities/countries without it. Excessive car traffic, car-based culture, lack of awareness about bikes in the traffic, implementing bike infrastructure, etc. In the course of 10 months, Paris has basically proved them all wrong. If you build it, they will come.